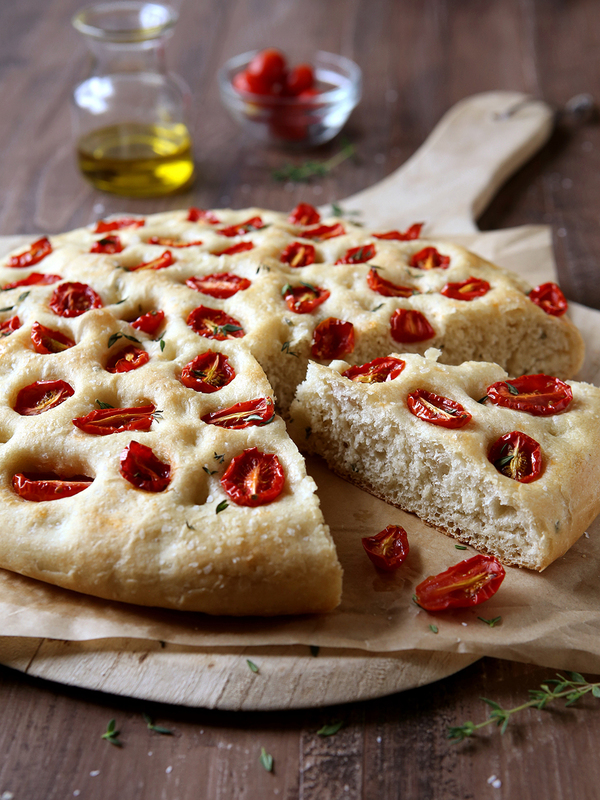 A light and chewy loaf of focaccia bread topped with roasted cherry tomatoes and fresh thyme. Heat the water and olive oil in a saucepan over medium heat until it starts to steam. Remove from heat and let cool for about 5 minutes, or until temperature is 120-130°F. In the bowl of a stand mixer fitted with a dough hook attachment, combine 1 cup of the bread flour with the salt, sugar, yeast and half of the fresh thyme. Add the water mixture and mix until it forms a wet dough, scraping down the bowl as necessary. Add the remaining bread flour ¼ cup at a time while mixing until dough clears the bowl and is tacky but doesn't stick to your fingers when touched. You may not need all 2½ cups flour. Knead for 5-7 minutes until smooth and elastic. Place bowl in a greased bowl and turn to grease top. Cover and let rise in a warm place until doubled, about 1 hour. Punch down dough and knead a few times to remove air bubbles. Shape dough into a rough 14 inch circle on a sheet pan, cover, and let rise for an additional 15 minutes. Use your fingers to dimple the dough, pressing your fingers all the way down. Brush with olive oil and gently press the tomatoes into the top of the dough. Sprinkle with remaining thyme and a heavy pinch of salt. Bake at 375°F until golden brown, about 20-25 minutes. Serve warm or at room temperature.